Students from the University of Southampton’s Winchester School of Art (WSA) have been working on a Winchester Area Community Action (WACA) project with Nepalese and ex-Gurkha elders – sharing ideas on craft skills and techniques. The Graphic Arts students have been taking part in the Hampshire wide project funded by The Silver Dreams Fund, through the Big Lottery, for the last six weeks of the pilot project lead by Clara Sanjar from WACA. 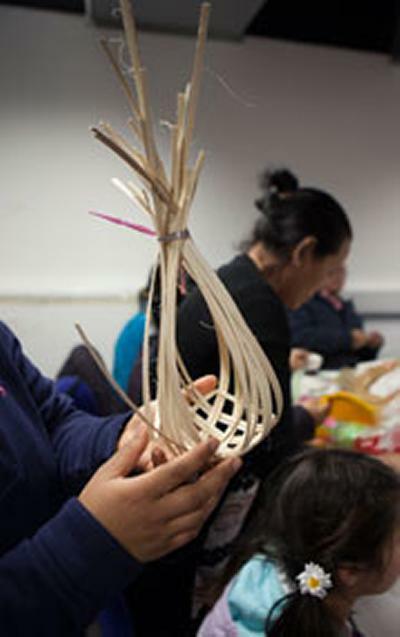 The students held workshops with Nepalese men and women from the Elders Crafts & English Exchange (ECEE) project group in Winchester, some of whom are former Gurkha soldiers. They exchanged knowledge and skills about crafts such as weaving, crochet, mechanical knitting and letter press-printing. Susanna Edwards from Winchester School of Art comments: “Many of the elders have recently relocated to England and this project aims to help them extend their engagement with the local community, build confidence with their communication skills and help them engage with, and contribute to, the local community. The students worked with the elders on illustrations depicting stories from Nepal, as well as creating maps and craft objects. They experimented with woodblock printing of English and Nepalese words and explored the practices of mechanised knitting and weaving. Photography students also worked with the elders to create portraits and document their craft objects. In return, the elders demonstrated their skillsets in weaving with bamboo, paper and plastic, as well as crochet and knitting. In particular, they showed the students how to make traditional woven mats called ‘Chakati’. Alongside these craft skills, rare insights into Nepalese culture were provided – with members of the group demonstrating traditional song and dance, presenting objects from Nepal and displaying traditional dress. Commenting on his experience of the project, student Diogo Lopes says, “Working with the elders was such a great experience. We learnt so much about another culture and also new skills that we had never tried before. The students have also used their design knowledge and skills to set up an online shop where the elders can sell their craft objects, such as the ‘Chakati’ mats, with proceeds feeding back into the ECEE Winchester group, which has now been self-sustaining for a year after the completion of a six-month pilot. There are longer-term plans to develop products through a collaborative venture between Winchester School of Art and ECEE. An exhibition showcasing the wider Elders Craft and English Exchange project is currently taking place at the Winchester Discovery Centre, Jewry Street, Winchester until Thursday 15th May 2014. Outcomes of the workshops staged at Winchester School of Art will form part of the display, including an image-led publication ‘Bhetghat Samuha’ documenting the student / elder interaction – which is available for a small donation, with profits being used to help sustain the future of ECEE. In addition, there are craft objects, drawings on glass, a legacy book and short film, made by Shedlight, incorporating WSA.